Plate pressed PVC sheet is produced by fusing together layers of a calendered intermediate film that has been specifically formulated to impart the desired performance characteristics for the finished product. A PVC calender is rather like an industrial scale mangle that converts PVC resin, additives and pigments into thin gauge sheet using heated rollers. To produce a pressed sheet of the correct gauge, multiple layers of the intermediate film are laid by hand between metal surfacing plates. 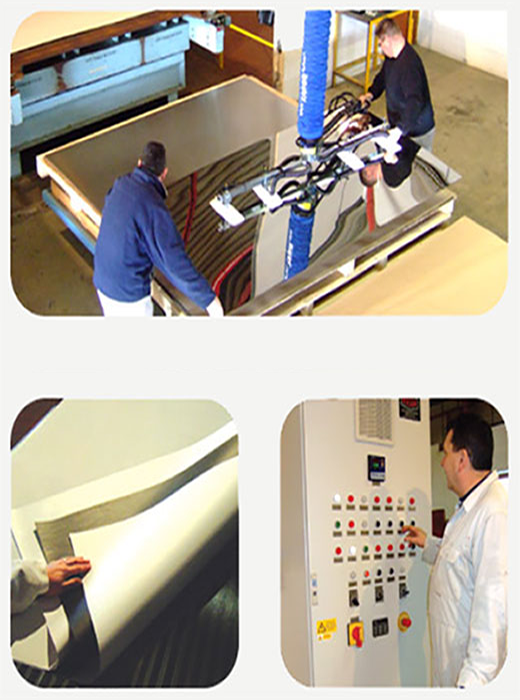 The finished sandwich of PVC is then inserted between the platens of the press and heated under pressure to the melting point of the plastic. At this temperature fusion of the layers takes place. The application of a second pressure allows the material to take the surface of the plate before a cooling cycle fixes the PVC in its new form. After cooling the sheets are stripped from the press, interleaved with protective paper before being trimmed to size prior to packing and dispatch. The finished product is a dimensionally stable sheet with a high quality surface finish free of the surface flaws associated with less sophisticated processes.